The devastating epidemic that claimed the lives of 100,000,000 people globally and at least 600,000 in the United States caused the death of her young father, the family support and breadwinner when she was only 3 years old. She was sent to live with her grandparents. Her sister died when she was about 5, from what was thought to be a heart condition, although diagnostics were limited then. Children often died and the cause was a sad guess. The separation from her mother and two other sisters was emotionally difficult for her, but under the financial circumstances in the family and nationally, her mother knew it was her best opportunity. Her grandparents had a small grocery store so no matter how limited their income was there was always nutritious food, for her, her family and the local community, her grandparents often taking a parrot, a zither, a paper IOU as payment from neighbors for their groceries. She was told at some point in her adolescence that she might not be able to have children, and yet she married and had three daughters. She had a heart attack. There was a diagnosis of breast cancer, a breast removed, chemotherapy. A broken hip. A thyroid condition. Upper respiratory infections. The long slow decline of Alzheimers. My mother, Rose, died last week at the age of 96. 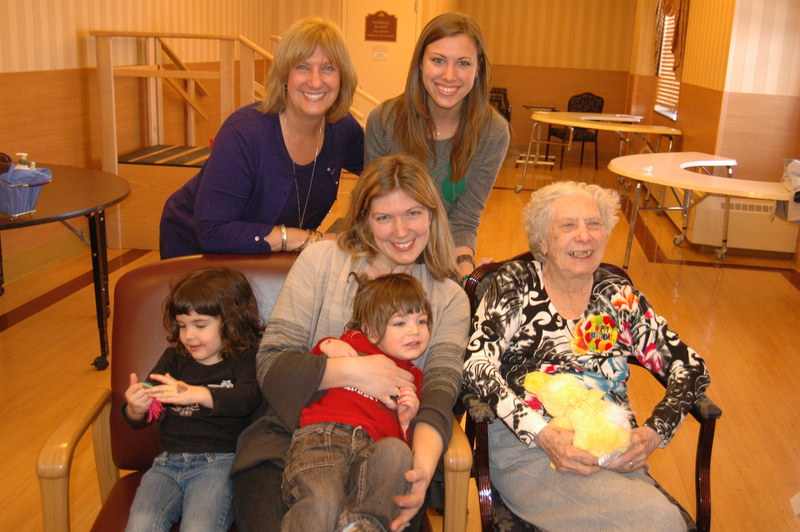 Despite the health and financial challenges, she thrived for most of those 96 years. Last August my youngest daughter, Alex, and I visited her at the nursing home she lived in for about 5 years. She was bright and happy to see us although at some point during the last few years I had realized that she might not really remember my name or which one of the daughters I was. But she was all smiles and hugs that day, and she loved that we were there with her. She particularly loved the granddaughters. Once about 4 years ago, she was rushed to the hospital barely conscious. My daughter Kierra and I met my sister in the emergency room and standing at her bedside we all believed that my mother was about to die. Concerned that she might, even in that state, be thirsty, Kierra dripped some juice from a straw onto her lips. She licked her lips and as the juice ran into her mouth she swallowed. Her eyelids fluttered open and she smiled at Kierra. “What are you all doing here, Sweetheart?” she asked. Fortunate to have had her for so long and to have been able to spend her last two days of life with her, I am still grieving, but I also can’t help but wonder what it was that contributed to her long life. My father died in 2001 at the age of 86 from a heart attack. Most of my parents’ friends have died. When I think about the generally accepted contributors to health, exercise, good nutrition, and keeping mentally active, I wonder how these affected my mother’s life. She was always active gardening, cleaning, taking us kids to the beach, helping at the church, but she never went to a gym, never ran, never wore spandex. Even at the beach she wasn’t a swimmer. She and my father though would take walks around the neighborhood, holding hands. And nutrition, well, she was an amazing cook and in the summer months was always gathering fresh fruits and veggies and then canning and freezing them to get us through the winter with those summer vitamins. But, there was lots of meat (red and otherwise) in our diets: Sunday roast beef, pork and dumplings and sauerkraut, fried chicken, bacon and eggs for breakfasts. I remember that when I was in elementary school, the other little girls had these darling little sandwiches made of cream cheese, and peanut butter and jelly, maybe tuna salad, cute sandwiches with the crusts cut off. I however, would remove from my lunch box, big hunks of homemade bread with a fried veal cutlet or slabs of leftover Sunday roast beef. And by the way cutting off crust was considered totally wasteful and my parents subscribed to the philosophy that eating “crusts makes you pretty.” And of course there were not only the sandwiches…..my lunch box consistently contained a big slice of homemade lemon cake (with frosting) or apple strudel or a poppy seed pastry or chocolate chip cookies. Well into my parents’ late 80’s, my mother was known as the “Cookie Lady” in their neighborhood because rather than giving kids’ candy bars for Halloween, she baked cookies that she and my father put in little baggies with ribbons to give out to the costumed callers. They were renowned at their church for making literally hundreds of donuts (fried in hot oil of course!) for the Fastnacht celebrations every year the night before Ash Wednesday. For all of this, neither of my parents were ever overweight, nor are or were any of their off-spring. So exercise and nutrition in my mother’s life were not exactly by the public health book. Keeping mentally active was. When I was in high school, my mother, who was a very good student in high school but never went to (as if it would ever even have been thought of) college, became the assistant for a well-known sociologist in Stony Brook. She took over his academic life as a gentle whirlwind, organizing his books, redeeming royalty checks that were long expired, editing his manuscripts, negotiating with publishers and handling all of his correspondence and travel plans. Long after Dr. Nelson died in his sleep on a train in Italy, my mother continued to read academic articles and edited my sister’s doctoral dissertation and my masters thesis. But that wasn’t all. She sewed. No, she didn’t just sew, she was the mastermind of three daughters’ and her own wardrobes. Months before Easter Sunday, we would all make a pilgrimage to various fabric stores where we would study pattern books for the latest fashions, hunt through bolts and bolts of fabrics, and ferret out the best notions: little fabric frogs, buttons, lacey trims. And then over weeks my mother would work her magic with pins and those thin paper patterns and hours and hours at the sewing machine. And those, long “hold still!!! !” sessions of her pinning up the hems and adjusting waistlines, shoulder seams and zippers. She knit us sweaters and scarves and crocheted a dress for me that I still have. She made millions of little craft items and baby sweaters and booties, and cloth dolls for church fairs. When the grandchildren she adored came to visit she taught them how to make little Christmas mice, pot holders and seashell jewelry. She always had the best craft supplies. My daughter Kristin loved those little Grandma mice. So what else? Certainly the literature supports the association of a long stable relationship with health. Rose and Charlie were together in a loving mutually supportive marriage for almost 70 years. My mother had a very strong network of family support, neighbors and church members: a social support being a strong indicator of health. My father worked for Grumman Aircraft and so we all had good healthcare benefits: I actually remember as a child when my parents thought I might have polio, the doctor coming to our house with his little black bag. My parents didn’t know any of this and perhaps all the coffee health benefits were outweighed by my mother’s yummy buttery pastries and cookies and cakes that went along with the caffeine and antioxidants, but I do believe that the two of them sharing coffee at breakfast, the mid morning coffee, coffee with lunch, the mid afternoon coffee break, coffee after dinner and the late evening coffee (usually accompanied by ice cream,) contributed to my mother’s long and happy life. Maybe it was the conversations they had while they were drinking coffee or the plans they would make or the hand holding that went along with the coffee. My mother was not a public health professional, she wasn’t a nurse or a doctor although I do truly believe that she saved my life several times when I was a child by making me yum yum, a combination of hot milk, honey and butter, in the middle of the night. She wasn’t a great philanthropist with a foundation that put her name on some medical center building or library, and she wasn’t the author of any great books. Her long loving life is however a testimony to a life well-lived and perhaps the greatest lesson we can learn about our own health and improving the quality of life in the world: Love the people around you. Be passionate about everything you do, especially those the small acts of kindness. Make the world more beautiful in your own unique way. Love children, grow roses, knit a scarf, bake cookies, smile at strangers, hold a hand, share a cup of coffee, change the world. In a glass measure, pour 1/2 cup milk. Add 2 large eggs and whisk together to blend. In a large mixing bowl, measure 2 cups all purpose flour, 1 teaspoon baking powder and 1/4 teaspoon salt. Stir to mix. Make a well in the center of the dry ingredients and pour in the milk and egg mixture. Use a wooden spoon to mix well. Dough will begin to get stiff. If it is very sticky, add a little more flour. The dough should not be sticky, but should still be soft enough to roll into a sheet. Divide the dough into 2 pieces. Roll out one piece at a time into a thin sheet and cut (with scissors) into 4 square pieces. Place a half of a peeled, pitted peach on each piece of dough, and add a small piece of butter, sprinkle with cinnamon and sugar. Fold in the corners of the dough to cover the peach half. Be sure the peach is sealed well in the dough. Repeat with the other piece of dough. Sprinkle some flour on a clean surface. Set the peach dumplings on the flour and cover loosely with a clean kitchen towel. Bring a large covered pot of water to a boil. When water is boiling hard, gently drop the dumplings into the pot. Put the cover on the pot. Set the timer for 20 minutes. Do not take the cover off the pot until the timer rings. Transfer each dumpling to a large dinner plate. Prepare to eat by cutting into small pieces. Pour melted butter over the dumpling. Sprinkle with more sugar and cinnamon. Eat. Enjoy!! !